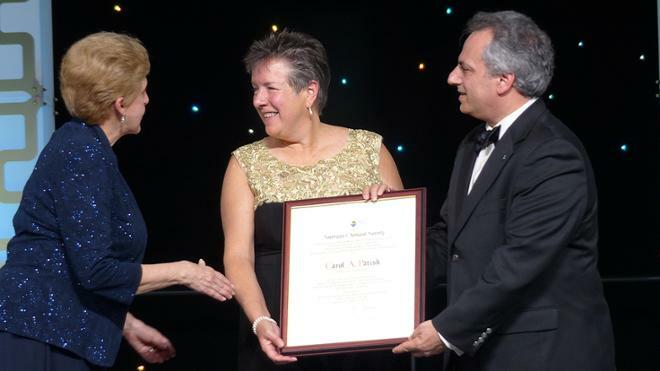 Editor's Note: This release was updated April 22, 2019 to add a photo of Carol Parish receiving her award during the ACS annual meeting in April. The American Chemical Society has awarded University of Richmond chemistry professor Carol Parish the 2019 Award for Research at an Undergraduate Institution. The award is the highest honor for a chemist at an undergraduate institution and recognizes a chemistry faculty member whose research has been both greatly recognized and has aided in the professional development of students. “This honor recognizes the best part of my job, which is mentoring undergraduates, training the next generation of scientists, and helping students achieve their post-UR hopes and dreams,” said Parish. Parish, an expert in computational and theoretical physical chemistry, has published more than 40 research publications with 60+ undergraduate coauthors. Her research is diverse by design; the unifying theme is the methodological, molecular-based approach that is employed. Her research program has been supported by more than $3.3M from the Department of Energy, the National Science Foundation, the American Chemical Society Petroleum Research Fund, the Camille and Henry Dreyfus Foundation, and the Jeffress Memorial Trust. Parish, who has taught at UR since 2005, is often recognized for her research and her contributions to mentoring undergraduates. She was recently awarded a National Science Foundation grant for her research on alternative energy sources, and she received an Outstanding Faculty Award by the State Council of Higher Education earlier this year. She served as the founder and program coordinator of UR’s Integrated and Inclusive Science program from 2015-2018. She also serves as the Director of the UR Beckman Scholars program, which provides scholarships for faculty-mentored student research. She has mentored 100 undergraduates in externally funded research focusing on developing an understanding of important processes in chemistry, biology, and physics. Her students have won numerous nationally-recognized scholarships, including from Goldwater, ACS, Rhodes, Marshall, Gates, and Fulbright. Parish will be honored for this award in the spring during the annual ACS National Meeting in Orlando.